The Kid is big on watching documentaries and she’s seen a few on the meat industry. As a result, she’s always tossing around the idea of eating less meat. Since she has a dairy allergy, she likes to say she’s already one third vegan so taking out meat would make her two thirds of the way there. Vegan places make dealing with a dairy issue so much easier. You roll in, order, eat. No third degree questioning of the waitstaff. No getting the manager or drawing attention to yourself. These are big things to a teenager, and it makes Mom happy too. So we try to search out vegan restaurants while on our travels and we’re pretty used to some of the non-mainstream foods. Since we play around a bit with eating less meat, you see a few cluck and moo-free recipes but you always have the option of dropping the faux and adding meat. I’ll clarify that I enjoy eating different foods and experimenting so I do this for non-moral reasons. LOL, I don’t want to give you the wrong impression. I approach it as I do most things. Nothing is off limits, but I eat some things in moderation and not enjoy them daily. I do eat eggs, protein powder, and meat but eat less than I typically do to support The Kid. My wallet is happier too since lentils are waaaaaay cheaper than chicken. Remove the tofu from the package and drain the water. Place the block on paper towels on a plate and cover with another plate to press the excess water out of it. You can add a can or two on top of the second plate to weigh it down a little if needed. After about 30 minutes, drain off the extra water and slice the tofu into slices. Cook the rice according to package directions if needed. If you’re starting with cooked rice, skip this step and just warm it in the microwave. Mix the vinegar, miso, sesame oil, soy sauce, brown sugar, and garlic in a small bowl. Whisk to combine. If you like, add a small splash or two of water to make a salad dressing consistency. Set aside. Heat a pan over medium high heat and spray with non-stick spray. Add the kale to the pan and saute until wilted. Remove from pan. Add the tofu slices and cook until browned, flipping a couple times to cook them evenly. Remove from pan. Break the eggs into the same pan and cook about 3 minutes until done as you prefer. Remove from heat. Divide rice into bowls, top with the wilted kale and fresh radishes. Add the tofu slices and cooked egg. Sprinkle with green onions and sesame seeds and drizzle with the dressing. 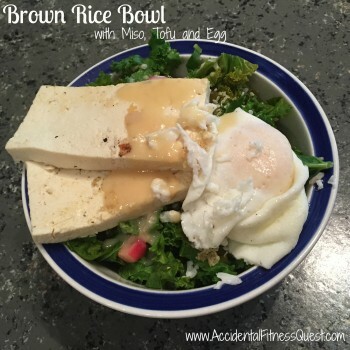 Makes 4 bowls at approximately 314 calories – 20g protein, 27g carbs, and 14g fat. As I mentioned, you can swap out the tofu for chicken or steak if you prefer. Obviously to make it vegan, you’ll need to remove the eggs but you wouldn’t miss them. It’s pretty flexible to make it your own.